Trade shows allow products to escape the confines of a website or catalog, granting firsthand access to curious attendees and loyal customers. A unique product demonstration will draw a crowd and encourage attendees to engage with products, the brand and staff to learn more. Remember, eye-catching product displays are a primary support for your sales team. Before designing your exhibit, it is essential to determine which products you want to display (which could vary from show to show!) and identify key product specifications and needs. This will lay the groundwork for your exhibit design. The design of the products themselves is also very important as there is no point showing off weak branded products. For assistance with branding new products, or if you fancy giving existing products a new makeover, you should consider using a design agency to brighten up your products. Getting an external company to develop packaging ideas for your products create will attract audiences to your brand as design agencies know what attracts customers towards trying new products they wouldn’t otherwise try. 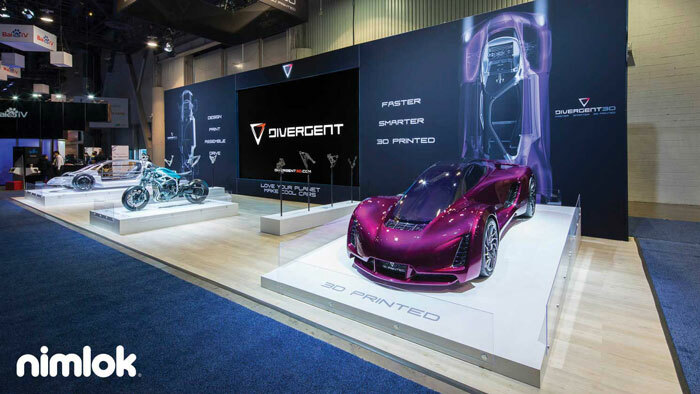 Products often range from large machinery to delicate parts, so it is crucial to rent your exhibit space based on your product display size needs. Measuring product dimensions and accounting for desired quantity will ensure that your booth has adequate space for your products. It is essential to incorporate exhibit structures that support your exhibit, especially for heavy products that cannot be safely kept on a shelf. 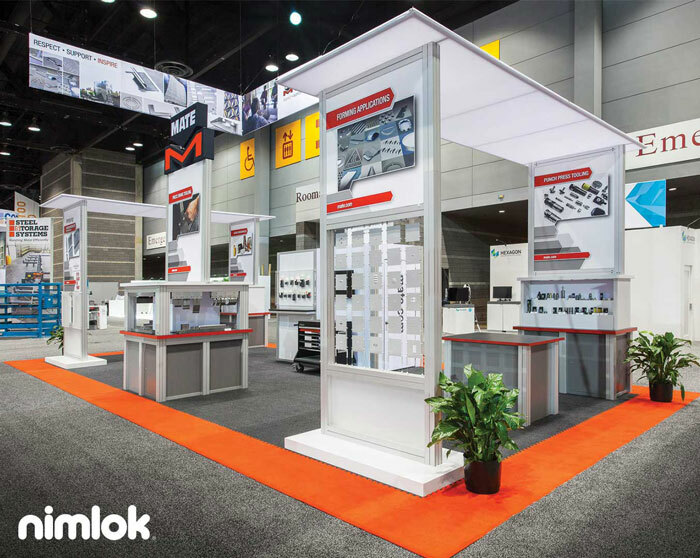 This exhibit Nimlok built for Mate Precision Tooling displays small products on shelves, medium-sized products on counters and large machinery on podium structures. If your products rely on electricity then be sure to devise a plan for running power and cord management. Additionally, include a backup extension cord or power strip in your emergency kit for peace of mind. If you plan to store your products after show hours, discreet, lockable storage spaces are vital part of your exhibit design. Storage elements such as custom counters or a walk-in storage room, ensure your products are safe after show hours. If your product is the center of attention, then it should be the focal point of your booth. However, if your product functions to support your brand, then it is considered complementary. If you choose to showcase your product as the focal point then all other design elements should support the product display. 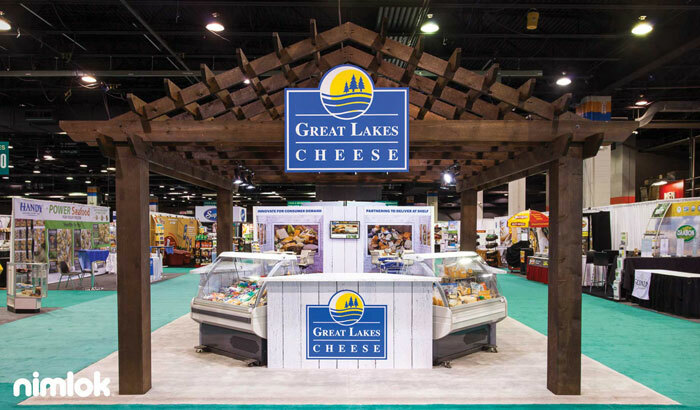 If your booth’s priority is an increased brand awareness, then your complementary product display should support that goal. As the exhibit design process approaches take any extra steps to plan for product launches and demonstrations. Above all, make sure to openly communicate your product demonstration’s needs and specifications with your exhibit designer so they can design demo space accordingly. After defining your product needs, the next step is to work with a designer to translate those needs into an exhibit solution. Here are a few points to keep in mind. The space you rent should be proportional to the size and quantity of products displayed. Larger products, or a large quantity of products, will often necessitate larger booth spaces. If you plan to add a product demonstration, be sure to include space for presenters and ample room and amenities for audiences. Hanging signs can broadcast your brand across the show floor. They can also be used inside the exhibit to distinguish between product lines or divisions. 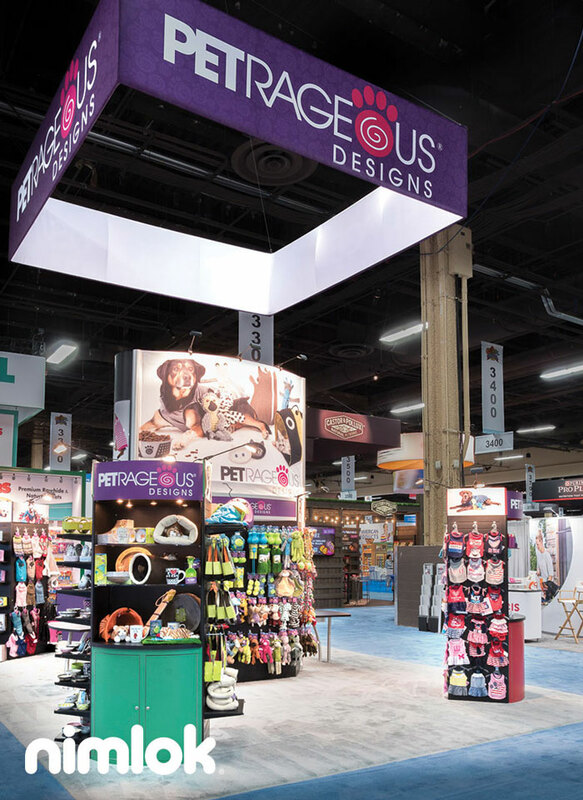 Greater visibility from hanging signs can lead to increased booth traffic, meaning more eyes on your product displays. Keep in mind, a larger booth space is typically required if you plan to use a hanging sign in your exhibit. Catch attendees’ attention with graphics that communicate product features and functions. Graphic elements around product displays can aid your sales team when engaging with visitors. Pro Tip: Make sure that product displays are not blocking key information on the graphics, such as brand messaging, logos or designs. Proper communication with your exhibit designer will prevent this from happening. Display lighting is a key element for directing attention in your trade show booth. 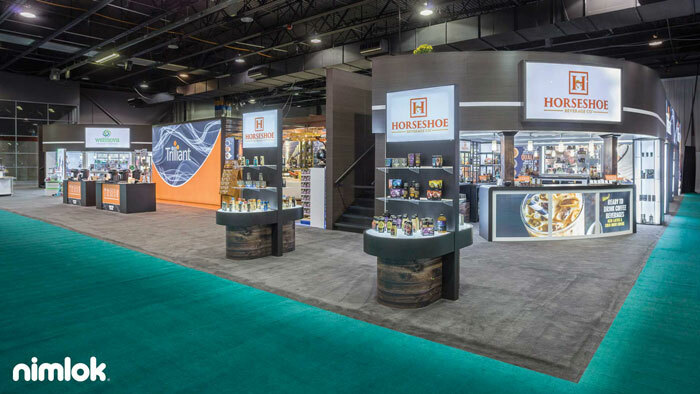 Illuminating your product display will both draw the attention of attendees towards your products, as well as highlight their best and brightest details. Make sure to arrange product lighting to avoid any unsightly shadows, carefully creating a well-lit environment that showcases your offerings. Media, such as videos, virtual reality, catalogs and music, can place products within their everyday contexts, allowing attendees to visualize how the product can help them beyond the trade show floor. Consider your messaging objectives and target audience when choosing the right types of media to incorporate into your booth. Beyond general booth design principles, you will find a wide variety of finishing touches to jazz up your product display. Include these functional solutions to add value and organization to your exhibit. • Products should be arranged attractively, similar to a luxury retail experience. • Avoid overcrowding and cluttering your displays with too much product. Less is more when it comes to creating a comfortable environment. • Incorporate a promotional item into your product display to drive traffic. • Everyone likes free swag, so a contest or giveaway will create a buzz around your products. • Promotions paired with product demonstrations will make attendees excited about your brand. • Give sales staff the necessary tools to sell and generate leads. • Create space for lead machines, UPC scanners and payment methods to make sales. 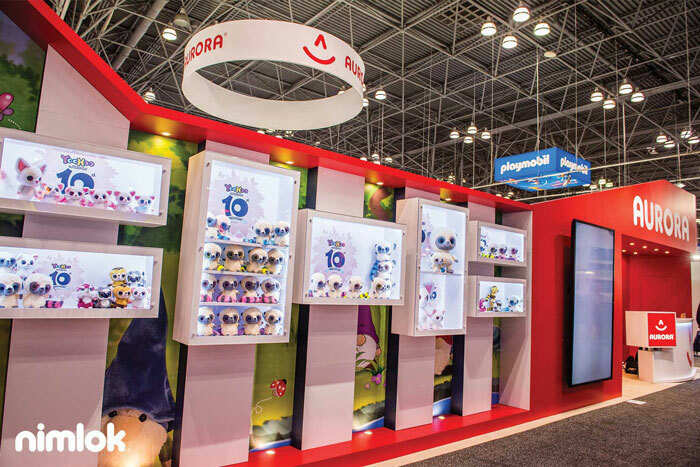 Follow these steps to include stunning product displays at your next trade show. Let your products shine by creating a dynamic booth environment that allows staff members to work their magic. An organized space will save everyone valuable time and energy. It was nice when you said that hanging signs of your tradeshow booth can help you to get the attention of more people because they can easily see your product displays. My husband and I are dreaming of participating in a trade show event in the future. We absolutely want to sell products to a lot of people, so we wanted our trade show booth to be as eye-catching as possible. I will make sure to hire a professional that can help us with our trade show display.